Salamini, Salamelle & Salsiccia | Pasta & Co.
“Sausage” is not a clear nor sufficient translation for Salamino or Salsiccia. The salamino cacciatore (p. caccha-toreh, meaning hunter) is a dry, yet soft and savory, link made from the best pork (the same used for Prosciutto D.O.P. di Parma and San Daniele). It’s called “Cacciatore” as it was the traditional portable snack for a long day’s hunt. 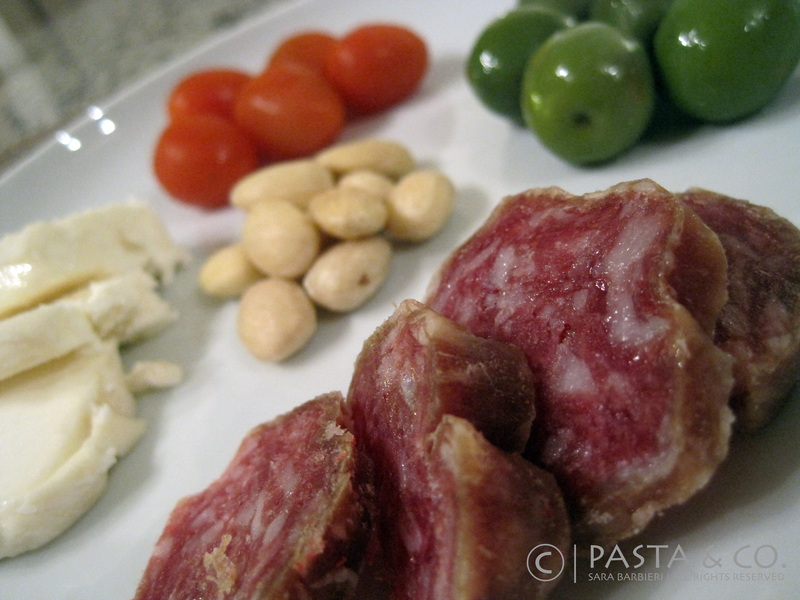 I love it for aperitivo paired with olives, bread or gnocco fritto and a good glass of wine. Italy has a long tradition of salame production, every region has its own traditions and kinds: Salame di Milano, Felino, Soppressata, Ciauscolo, Ndjuia, Salame di Suino Nero di Ebrodi and Finocchiona are the most famous, but there are hundreds more. The Salamella (p. sal-am-eh-llah), instead, defines a thick long sausage divided in smaller links. These are tied together by a thin cord, so when the butcher needs 5-6 salam-ell-eh (plural), he would cut the cord and not the meat. This kind of sausage is usually cut lengthwise and grilled on the barbecue or on the griddle. The panino with grilled salamella is typically found as menu option in all Italian countryside festivals. 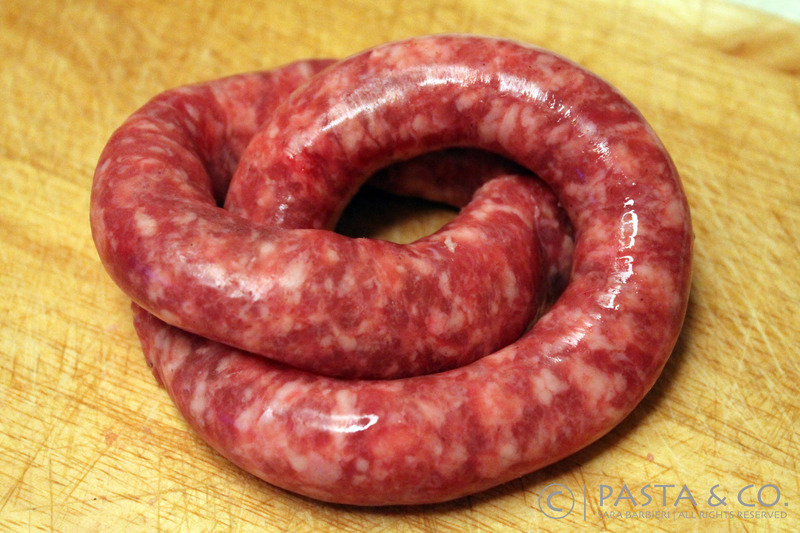 The Salsiccia (p. salsiccha) is a fresh, long coiled sausage not divided into smaller links and sold by the meter. It is usually mild, lean and can contain fennel seeds. It is also known as lüganega (p. luh-gah-nee-gah). Risotto with lüganiga is one of the typical dishes of my hometown. No way I could find this long salsiccia here. 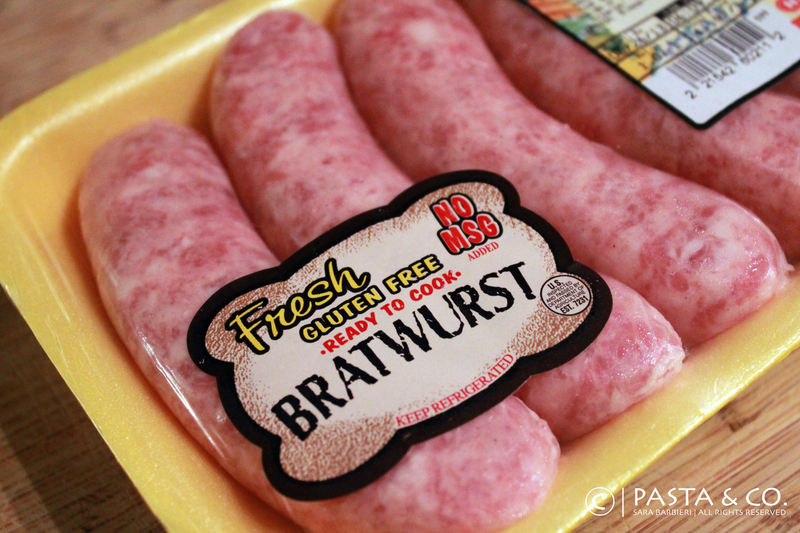 The most similar in flavor is the Fresh Bratwurst Sausage I buy at HEB (more kind of a salamella). Sometimes they add some fennel seeds. I use it plain (no beer added) and it turns out really good in Risotto, Paccheri alla Divina, and on the BBQ!